The preservation of waterlogged organic materials has transformed our understanding of the historic environment. Their study involves the collaboration of many different disciplines from within the heritage sector. This guidance is aimed at anyone planning for or working with waterlogged organic artefacts, including archaeological curators, archaeologists and specialists (finds specialists, environmental archaeologists and conservators). 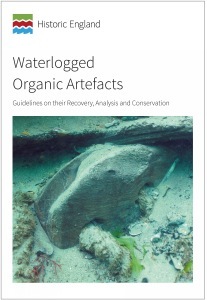 This guidance will help the reader appreciate the information and research potential waterlogged organic artefacts can offer. It will briefly describe material conditions and commonly applied conservation techniques, in order for people less familiar with these situations to make the right decisions when commissioning work. For practitioners in the field, it contains useful advice on lifting, storage and packaging. The chapter on analytical techniques highlights areas for further research. Case studies and specialist views are provided to illustrate the principles with real-life scenarios.